Extubation failure is associated with considerable morbidity and mortality in postoperative patients with congenital heart disease (CHD). The study purpose was to investigate initial extubation success utilizing neurally adjusted ventilatory assist (NAVA) compared with pressure-regulated volume controlled, synchronized intermittent mandatory ventilation with pressure support (SIMV-PRVC + PS) for ventilatory weaning in patients who required prolonged mechanical ventilation (MV). Also, total days on MV, inotropes, sedation, analgesia, and pediatric intensive care unit (PICU) length of stay (LOS) between both groups were compared. This was a non-randomized pilot study utilizing historical controls (SIMV-PRVC + PS; n = 40) compared with a prospective study population (NAVA; n = 35) in a Level I PICU and was implemented to help future trial designs. All patients (n = 75) required prolonged MV ≥96 hours due to their complex postoperative course. Ventilator weaning initiation and management was standardized between both groups. Ninety-seven percent of the NAVA group was successfully extubated on the initial attempt, while 80% were in the SIMV-PRVC + PS group (p = 0.0317). Patients placed on NAVA were eight times more likely to have successful initial extubation (odds ratio [OR]: 8.50, 95% confidence interval [CI]: 1.01, 71.82). The NAVA group demonstrated a shorter median duration on MV (9.0 vs. 11.0 days, p = 0.032), PICU LOS (9.0 vs. 13.5 days, p < 0.0001), and shorter median duration of days on dopamine (8.0 vs. 11.0 days, p = 0.0022), milrinone (9.0 vs. 12.0 days, p = 0.0002), midazolam (8.0 vs. 12.0 days, p < 0.0001), and fentanyl (9.0 vs. 12.5 days, p < 0.0001) compared with the SIMV-PRVC + PS group. NAVA compared with SIMV-PRVC + PS was associated with a greater initial extubation success rate. 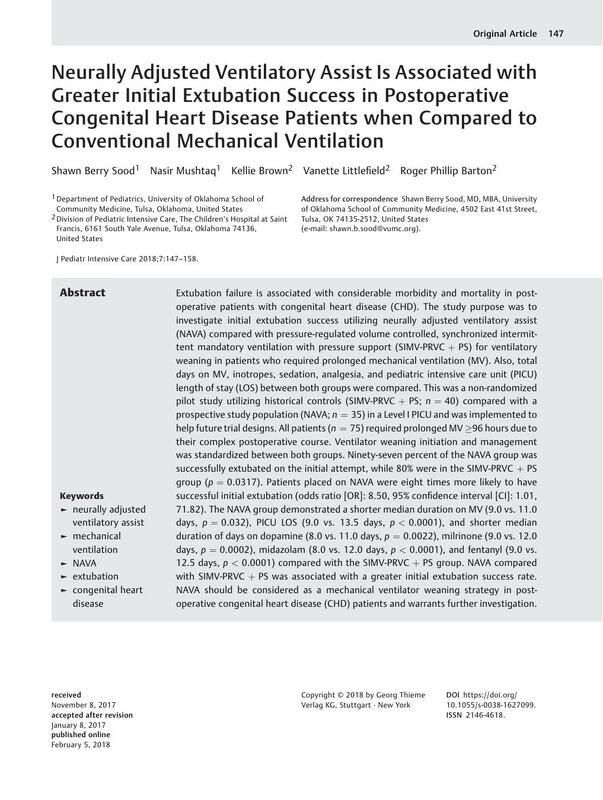 NAVA should be considered as a mechanical ventilator weaning strategy in postoperative congenital heart disease (CHD) patients and warrants further investigation.